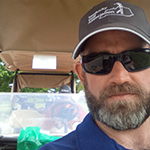 Dave is the author of OneBeardedGolfer, where he espouses definitive opinions on golf courses and golf as a part of daily life. A married father of one, he’s a semi-professional cynic that mixes his cantankerous perspective with satire, wit, and humor…poorly. When not on the golf course or at Kentucky football games, you can find him working on his lawn and garden, always with his trusted Labrador-boxer mix, Birdie, by his side. You can follow him on Twitter, though he’s not sure why you would. Posted in #Golfchat Authors, Dave Hill, Great Golf Experiences, Uncategorized.